Most Germans and Americans support the planned Transatlantic Trade and Investment Partnership (TTIP), a recent study shows. But the devil is in the details, as both sides remain sceptical of each other’s standards, and Germans lack trust in EU negotiators. EURACTIV Germany reports. So found a study released on Thursday (10 April) by the Pew Research Center, in cooperation with the Bertelsmann Stiftung, revealing a significant transatlantic discrepancy over regulatory trust. Germans in particular, see the EU regulatory framework as far superior to that in the US. The study’s results showed 96% of Germans trust European environmental protection standards, while only 2% trust the regulatory framework in the US in this area. On food safety, the ratio is 94% to 2%, for car safety standards it is 91% to 4%, and on data protection, responses showed an 85% to 3% difference. The trust Americans have in US standards is by far not as one-sided. Nevertheless, the study further observed that more than seven out of ten Americans and Germans see strengthened trade activity between the United States and the EU as advantageous, with eight in ten Americans supporting more trade with Germany specifically. With a ratio of more than two to one, Germans (55% to 25%) and Americans (53% to 20%) said they believed TTIP would be positive for their countries. The goals of the agreement includes a removal or reduction of tariffs in merchandise trade, elimination of investment restrictions, and establishing common technological and regulatory standards. Americans and Germans alike also share criticism over individual components of the comprehensive initiative. Only 38% of Germans and 41% of Americans support the removal of all tariffs for transatlantic trade in goods, while 41% of Germans and 39% of Americans are in favour of lifting restrictions on transatlantic foreign investment. But glaring disagreements lie in the alignment of transatlantic regulatory standards: while Americans support this goal at a rate of 4 to 1 (76% to 18%), only 45% of Germans agree on the harmonisation of standards. The study also revealed telling results concerning the effects of Euroscepticism on the perception of the TTIP negotiations. Results indicate a trust deficit within Europe, with only a minority among Germans agreeing the EU should negotiate international trade agreements on Germany’s behalf. In fact, the majority of those surveyed want Berlin to take over the negotiations in place of Brussels. Here, the authors of the study offer two possible explanations: On the one hand, the response could indicate that a majority of Germans simply do not know that negotiation of free trade agreements is an exclusive competence of the European Commission. Or, the trend might mean a general mistrust exists among Germans regarding EU institutions. As a result, a majority of the German populace is sceptical when asked whether or not the Commission is able to adequately negotiate in the interest of Germans. The opinion pollsters claim TTIP is suffering from a “double deficit”. In the study, they cite a lack of understanding combined with a lack of trust. To address this, Pew and Bertelsmann recommend more transparency and dialogue. The diversity of opinions that show up in the survey indicates that more transparency could create a good basis for fact-based dialogue in society, the authors suggest. They say discourse of this kind is necessary to assess the real value of differing standards. TTIP is currently being negotiated in Brussels and Washington. 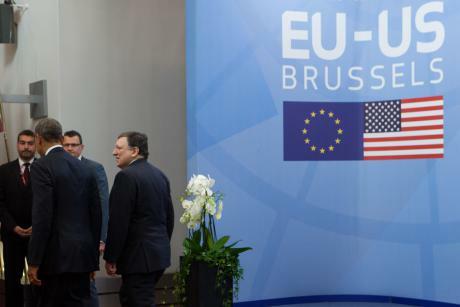 At the EU-US Summit in Brussels in March, US President Barack Obama explained that the final agreement would contain more consumer protection measures and stricter environmental standards. The final result should benefit everyone not just a privileged few, the president emphasised. In an attempt to promote dialogue on the issue, the European Commission has released a draft of the TTIP agreement’s investment protection chapter for public consultation. Now, the public has three months to comment on a draft of the particularly controversial chapter. After the consultation period has elapsed, the results are intended to be incorporated into the Commission’s negotiating position. As far as the German government is concerned, it does not see a need to include investment protection standards in the agreement with the US. “Our view is that the United States and Germany already offer sufficient legal protection from national courts”, explained Germany’s minister of economic affairs Sigmar Gabriel in late March. lack of trust?? Of course it’s positive for both sides because if each other mistrust then this means both sides have strong consumer protection measures ! why complicating negotiations about “Standards” right now . Go for the best consensus between standards ! Best of Europeans one s , Best of Americans one ‘s and the results coming out is that we have the best of BOTH! NO! Most Americans actively oppose this treaty.